KUALA LUMPUR: To mark Rare Disease Day 2015, Malaysian Rare Disorders Society (MRDS) together with the Department of Medical Social Work of University Malaya Medical Centre (UMMC) held a special programme for patients staying at the paediatric wards of UMMC on 28 February, 2015. About 30 parents and children were treated to a magic show and a balloon craft presentation. A few volunteers including a Bugs Bunny mascot livened up the atmosphere with a dance together with the children. Dato’ Hatijah Ayob, the president of MRDS said that Rare Disease Day falls on the last day of February each year and its purpose is to create awareness of rare diseases. A rare disease is defined as a medical condition that affects a few people, usually genetic in origin. There are more than 6,000 rare diseases and if taken collectively, it may affect a significant number of people. 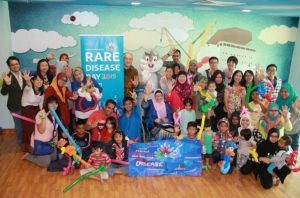 “We are very happy to celebrate Rare Disease Day 2015 with the children at UMMC and also to share about rare diseases with the parents and healthcare providers,” she said while handing out goodie bags and balloons to the patients. “Our member parents have at some point experienced staying in hospital to take care of their children receiving treatment. We hope that this is a welcome distraction from the hospital’s routine,” she added. The smiles on the faces of the children said it all. For more information on Rare Disease Day, please visit www.rarediseaseday.org. For more information on MRDS, please visit its website at www.mrds.org.my. 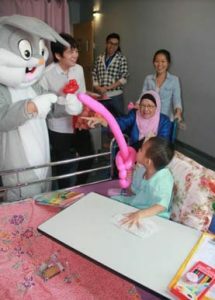 Dato’ Hatijah Ayob, president of the Malaysian Rare Disorders Society visiting a boy at the UMMC children’s ward. Raising their hands in support of rare disease patients. “Give me a four,” says Bugs Bunny to the delight of the child.